An exhibit of Robert Hofmann’s paintings, pastels and sketches set in the Middle East from World War I and after will open at the Wilson Gallery, in the Noreen Reale Falcone Library on the Le Moyne campus. 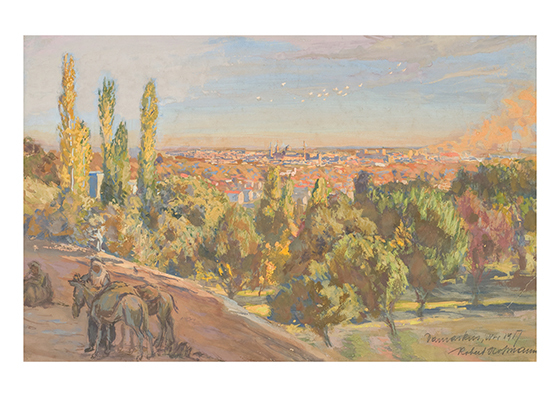 Robert Hofmann studied art at the Vienna Academy after serving in the Austrian and Ottoman armies during World War I. After completing his training he returned to the Middle East further developing his unique body of work. Following a career that took him from Vienna, to London and Australia, Hofmann subsequently settled in Syracuse in the 1950s where he maintained a studio and taught painting until his passing in the 1980s. On Friday, October 10, from 4 to 6 p.m., there will be an opening reception for the exhibit, which will be on display at the Wilson Art Gallery from October 10 to November 7 during regular library hours. The reception and exhibit are free and open to the public.